Redbud Entry, Designed by Armstrong & Walker Land. Arch. Designer: Armstrong & Walker Land. Arch. This deciduous shrub or small tree reaches 15' tall and 10' wide. Beautiful magenta flowers appear in spring, before the leaves appear. Foliage is apple green, turning yellow to red in the fall. Seed pods dangle on this tree in winter. Western Redbud prefers full sun but will appreciate afternoon shade in desert areas. It needs well draining soil. It is drought tolerant once it's established. It attracts hummingbirds and butterflies. A tree of varying interest all year round! This attractive California native has 2"-3" wide, evergreen leaves that are dark green but may turn reddish in winter. Foliage is mounding and dense. During spring, thin vertical stems emerge covered with small light pink flowers. Overall height of plant in bloom is 3' tall, spreading up to 2'. This Heuchera tolerates full sun in coastal areas but needs afternoon shade or full shade in warm inland areas. Can be planted under oaks. This plant tolerates clay soil. Established plants need only occasional water. Hummingbirds love these plants. Tufts of round leaves 2"-3" wide with scalloped edges accent this plant. It also produces wiry stems to 24" tall with open clusters of tiny, reddish pink, bell-shaped, fragrant flowers. Native to Desert Southwest so it tolerates desert heat, not humidity of deep South. It can also be grown in Colorado and Oregon in full sun with cool temperatures. This Heuchera typically spreads 12". Flowers can be used for vases. Prune spent flowers to encourage more blooming. This perennial has a mounding habit. In warmer and hot areas, plant in shade or part shade. This plant does best with well draining, fertile, moist soil. It does not tolerate clay soil well but will perform in rocky soil. Looks great in containers or along walkways. The California State Flower. This small annual (sometimes acts as a perennial) plant will grow to less than 1' tall and has light, small blue green leaves with gold and orange flowers that bloom in spring and summer. It is an aggressive grower and can get away from you in a residential garden space. Plant it in spaces where it is alright for it to roam. The California Fescue is a cool season bunchgrass with blue-green blades that reach 2' high. The violet colored flower stalks are 5' tall, appearing in spring and summer, creating fountain-like clumps. 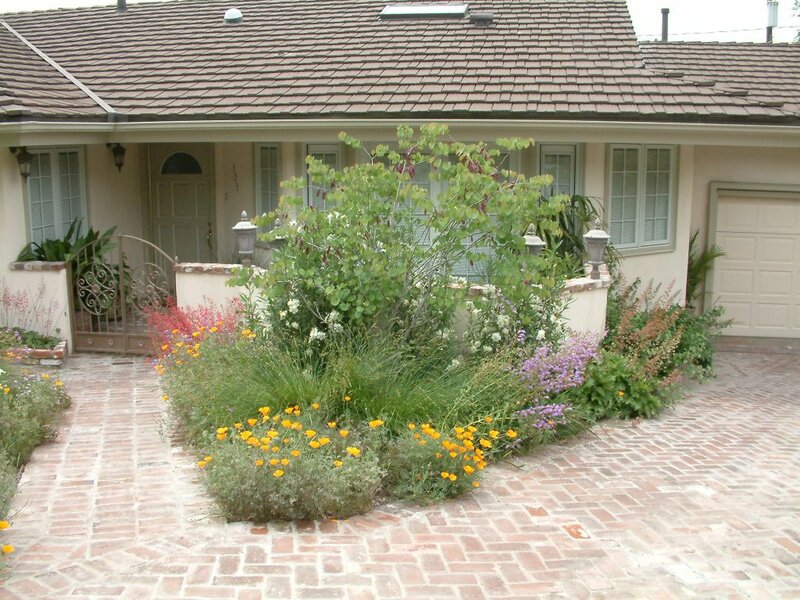 This grass is drought tolerant for sun and shade although it looks better with additional summer water. The California fescue is a beneficial insect plant. Plant on dry sunny slopes or on the edge of a dry creek bed.